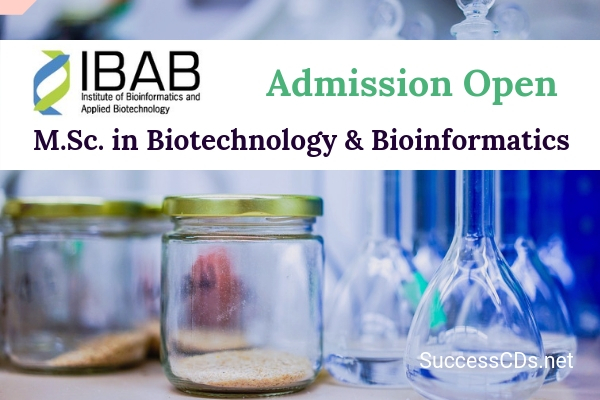 IBAB Bengaluru Entrance Test 2019 - Institute of Bioinformatics & Applied Biotechnology (IBAB), Bangalore invites applications for admission to Master of Science (M.Sc.) Program Offered in Bioinformatics & Applied Biotechnology for the session 2019. Candidates are advised to fill the application form after fulfilling the eligibility conditions otherwise their form will get rejected. To know all the information related to IBAB Bengaluru Entrance Test 2019 refer to this page. Applicant should have completed a bachelor’s degree (B.Tech, BE, B.Sc., MBBS, BDS, B.Pharm, BAMS) in any subject of Science/Technology such Computer Science, Chemistry, Pharma, Physics, Mathematics, Statistics, Biotechnology, Zoology, Botany, Biochemistry, Microbiology, Agriculture, Medicine, Dentistry or Veterinary Sciences. The applicant is required to obtain at least 50% (overall) in his/her Bachelor’s degree. Fill up all details online at link www.ibab.ac.in and separately send demand draft, two passport size photos and photocopies of marksheets to IBAB by post/courier. IBAB reserves the right to reject the application if the applicant does not meet the eligibility criteria. Please email msc@ibab.ac.in with your name and Application No. immediately after submitting the form online. Second round of selection is via a computerized test followed by a panel interview at IBAB. To qualify for the interview, all original certificates (10th, 12th and Bachelor’s transcripts and/or Degree certificate) have to be produced for verification. All fees can be paid by NEFT or Demand Draft (DD). Details are given below. Admission is liable to be cancelled if any fraudulent records are found even after securing admission. Any fees paid already will not be refunded.